The market capitalisation of the SEE TOP 100 listed companies in 2014 rose to 46.08 billion euro, as compared to 44.7 billion euro of the entrants in the ranking a year earlier. Two-thirds of the companies that made it into the ranking saw their market capitalisation increase in 2014. The ranking of the biggest listed companies in Southeast Europe (SEE), despite its inherent openness to new entrants, traditionally sees little change at the top. In 2014 Romanian and Croatian heavyweights again dominated the upper end of the table, as the top six spots remained unchanged, with oil and gas group OMV Petrom as the leader for a third year in a row despite a 13.1% drop in its market capitalisation to 5.16 billion euro. In 2014 the Romanian company, majority-owned by Austria’s OMV, posted a net profit of 409.9 million euro, down by 62%, on slightly lower revenue. For 2015, OMV Petrom has said it will reduce its investments by 20% “in light of the volatile and potentially prolonged weaker market fundamentals“. In August 2015, the company said it plans a secondary listing of its shares on the London Stock Exchange via global depository receipts. Several other Romanian companies, including state-controlled natural gas producer Romgaz, the third biggest listed company in the region, investment fund Fondul Proprietatea, at no. 4 in the SEE TOP 100 listed companies ranking, and power distributor and supplier Electrica, a newcomer at no. 13, are also listed on the London Stock Exchange. Romanian companies occupied five of the top ten places in the ranking, followed by Croatia with four entrants but with the biggest number of representatives, 27, in the overall ranking. This is hardly a surprise, given that the Bucharest bourse remained the biggest market in the region despite a 2.86% decline in its capitalisation, followed by the Zagreb Stock Exchange (ZSE) and the Ljubljana Stock Exchange (LJSE). This situation, however, seems likely to change if the Croatian and the Slovenian bourses keep up their growth pace of 8.34% and 23.98%, respectively, in 2014. Furthermore, in July 2015 ZSE signed a deal with CEE Stock Exchange Group to take over 100% of LJSE, with the transaction expected to be completed in the last quarter of 2015. Over the past years, as a rule, the lower half of the ranking is the scene for more dynamic developments as it is where most newcomers land. The 2015 edition of the ranking had 16 newcomers versus 14 in last year’s edition. Most of them, four, came from Slovenia, led by brewer Pivovarna Lasko, recently acquired by Heineken. Bulgaria and Croatia were tied for the second place with three new entrants each. Whereas the Bulgarian companies that made it to the ranking operate in different sectors of the economy, their Croatian peers – Croatia Airlines, SN Holding and Arenaturist – are all involved in tourism and travel, or industries closely interlinked with them. Tourism and travel are estimated to have generated 12.5% of Croatia’s gross domestic product in 2014. The company to record the biggest jump in this year’s ranking – of 45 spots to land at no. 44 – is also Croatian and a hotel operator – Valamar Riviera. The market capitalisation of the SEE TOP 100 listed companies rose to 46.08 billion euro in 2014 from 44.7 billion euro of the companies that made it into the ranking a year earlier, pushing up the threshold for entry into the ranking to 79.67 million euro from 65.5 million euro a year earlier. Diversity. 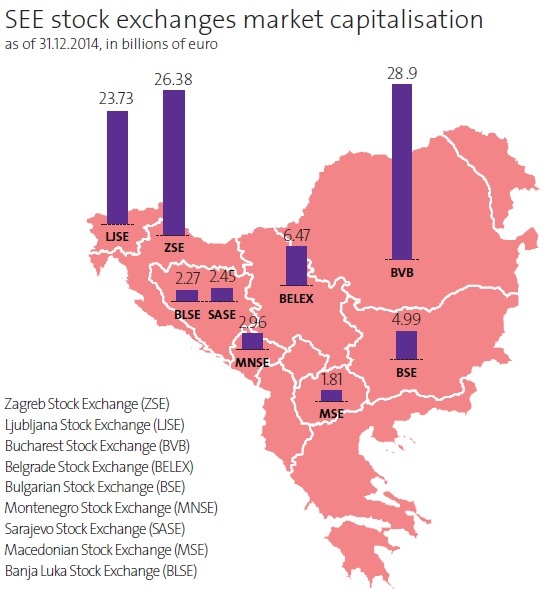 This word describes best the region of Southeast Europe (SEE) with its small and illiquid capital markets – the Bucharest stock exchange being one notable exception – but a range of investment opportunities they offer investors. New listings will be the key long-term market driver as investors are already well familiar with the existing entities in the regional investment universe. Stock picking will remain the best investment strategy in 2016 and improving economic environment will add fuel to the engine. Unless of course the global economic picture changes drastically due to slow growth in China or any geopolitical escalation. Over the last three years the major capital markets in SEE were moving pretty much in a pack. The main indexes in Romania, Bulgaria, Slovenia and Serbia аll advanced between 45% and 50% over that period. Croatia was the only laggard with slightly over 5% growth. The overriding theme over this past three-year horizon was the recovery from the crisis. The conflict in Russia and Ukraine, however, added significant pressure on the fundamentals at the end of 2014 and the beginning of 2015, as the two countries are an important export markets for many SEE companies. Consequently, this was reflected in the market valuations. Year-to-date (data as of August 19, 2015), the blue-chip SOFIX index of the bourse in Sofia was losing 10% of its value, followed by the SBITOP of the Ljubljana stock exchange with 6% decline. The BELEX15 of the Belgrade bourse was slightly below zero, while the CROBEX of the Zagreb bourse and the BET of the Bucharest stock exchange were offering gains of 3.1% and 6%, respectively. All markets were basically in a consolidation mode over the past year, with Russia and Ukraine as one of the reasons behind the lack of a strong upward or downward trend. The Romanian market has been the outperformer and ”the market of first choice” for most global frontier investors over the past few years, largely thanks to the Romanian government’s efforts to that end. The government raised millions of euro via the privatisation of state companies through the stock exchange, in line with its agreement with the International Monetary Fund. It also attracted a global emerging markets expert, Franklin Templeton, to run one of its most undervalued assets – Fondul Proprietatea. Big names attract more big names. Thus, Fondul Proprietatea has been on investors’ radars during the last couple of years. Surely, part of the upside there has already been consumed. Nevertheless, it is a door opener for more investors to come in Romania and in the region and for more companies to raise funding for growth. Fondul Proprietatea, alongside other big Romanian companies, has debuted on the London Stock Exchange to get additional visibility. A few more big listings in Bucharest and some further work on the stock market infrastructure, and Romania may end up being upgraded from an MSCI Frontier to an MSCI Emerging market ranking, which would increase significantly its visibility. This upgrade, projected to happen in 2016, has been on the local institutions’ agenda for a year now and investors have started pricing it in. Nevertheless, if it becomes a fact, it will be a huge step forth not only for Romania, but for the whole region. Expected new state listings in Bucharest will keep the market hot for both global and regional investors. However, once state support for the Romanian stock market diminishes, which is bound to happen at some point, it will have to start generating interest on its own – something the Bulgarian capital market has been struggling to do for years now. The end of 2015 and the beginning of 2016, however, may bring in a game changer as one of the biggest software developing groups in the country – Sirma group holding – will be debuting on the Bulgarian stock exchange in the autumn of 2015. Sirma’s IPO has been one of the most anticipated events on the market in 2015 both as an investment opportunity in one of the fastest growing industries and as an incentive for other IT, fast growing and good corporate governance companies to list. It is also a fairly large IPO, with an expected 26.4 million levs to be raised, tapping the markets’ ability to fund well-run and growing businesses – indications of which have been visible in other smaller listings on the Sofia bourse over the last two years. In 2013, a start-up leasing company – Elana Agrocredit – debuted on the market. Initially, it raised some 5 million levs from local pension funds and sophisticated investors and in the spring of 2015 it tripled its capital by raising a further 14 million levs. In 2014, the biggest courier company in Bulgaria – Speedy – raised fresh 20 million levs via both the market and a strategic investor, proving that investors’ appetite is strong for companies with good corporate governance, lean expansion strategy and transparent and well seasoned management.